I have a few items to check off this morning here on the blog and in *real life*, so it will be a quick post. 1. T is having surgery this morning to have a cyst removed from his back. He'll be home for 2 weeks. And then I'll need 2 weeks to recover from that. 'Nuff said. Please do keep us in your prayers today. 2. 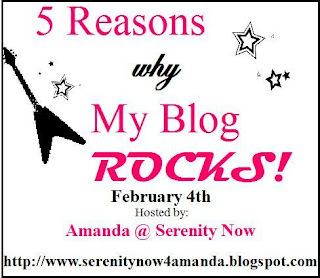 We're on for the 5 Reasons Why My Blog Rocks party tonight. MckLinky will go up tonight after 10 pm (ET). Please feel free to copy this little button for your post. Or just link up. Whatever you feel like doing. 3. 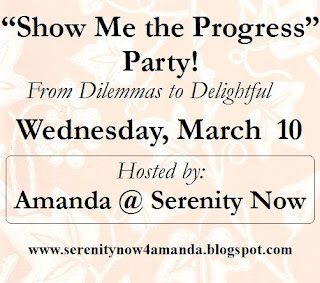 Speaking of why YOUR blog rocks, I got a few comments along the lines of "I don't think my blog really rocks, but this is a great idea for a party." That's sort of the point, my friends! It took me a few minutes to think of 5 reasons why my little old blog is a nice spot, but I did come up with a few. Be creative!! You don't have to have 3000 Followers or a new post twice a day to have a great blog. Do you post tutorials with lots of pictures? Do you enjoy writing to encourage others or share your faith with the world? Are you a good photographer? Are you an honest blogger who doesn't mind sharing her faults if it will help another person in his/her own life? Do you make a point to return comments in a timely manner? These are all things that (in my opinion!)) can make a blog a great place to visit! So...think hard and link up here some time in the next day or so. I hope you'll stop by. 4. In other news, I am working with a design company as I type this to get a new, clean look for this spot. Don't worry! I want Serenity Now to have the same fun feel and the same fun posts, but I need a cleaner and less cluttered look for the blog. I hope to reveal the new look and a new sponsor or two soon! You can still expect regular posts with some new parties here. Just don't freak out if you click over and it looks a little different, 'kay? Link up with your Dilemmas or Solutions in or around your home/garden and get some feedback from blogging friends on February 10th. And in March, get ready to share your Progress on March 10th...no matter how small (mine might be just going through some comments and making a few choices on paint and fabric). I hope to *see* you here tonight, linking up to share your favorite things about your blog! I'll say a prayer for Tim and your day! And I'm looking forward to seeing your re-design. You'll have to tell me all about it. I am sort of itchin' myself for some blog work. Hope all goes well w. the surgery, will certainly keep you guys in my prayers. 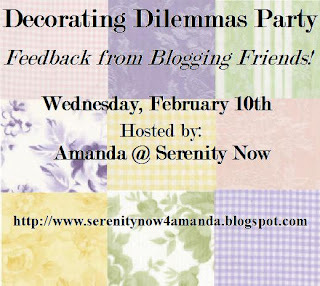 I'm excited for that decorating dilemas party, I've got a good one that I just can't seem to resolve. Hope everything goes well w/ the surgery! Praying for T's surgery and recovery! I'll see if I can think of (or fabricate!) five reasons and write a post to link up tomorrow morning. Thanks so much for your email; I've got to work on my to-do list, but I'll write back later today. I had to have the same procedure done last year. Mine was relatively small, but I still wish I'd had 2 weeks off from mommyhood- not that the recovery was so bad (it was really no big deal) but because of where it was I wound up pulling the stitches out accidentally from picking up the kids. Anyway- hope all goes well! I hope that T's surgery goes well and that his recovery is painless for both of you. Two weeks at home is a long time. Does he have some video games and books to keep him occupied?? God bless you and T today, Amanda. Take care of yourself. We'll be praying for you. I'll be saying a little prayer for you today :) Can't wait to see a new look! Your party in March is going to be my motivation to get something-- ANYTHING-- done in my master bedroom. I am sad to report, absolutely no progress has been made in there since your January party. Tell T we are praying for him. I hope everything goes well. Of course, we will also be praying for you. Keep us updated! Hope all goes well with the hubby's surgery. Consider yourself lifted up! ;) I will try to McLinky with you!! (even though Seizing My Day is new... I think I can find a few rocks!!) Blessings! Praying for T's safe surgery & fast recovery. Have fun having him home to enjoy the girls and you. Just thought in case "caught in a loop" checked back, I tried and couldn't comment on her blog...the word verification box wasn't big enough and I couldn't leave my comment.